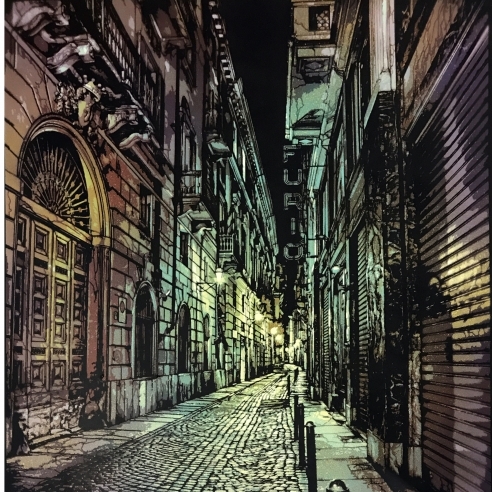 New York, NY - Taglialatella Galleries is pleased to announce an opening reception for artist Logan Hicks, meant to celebrate his numerous achievements of 2016. Highlighting his year, Hicks was commissioned to paint the famous Houston Bowery Wall, located on Houston Street and the Bowery in New York City. The wall was originally painted by Keith Haring in 1982 and has hosted murals in recent years by world-renowned contemporary artists, such as Shepard Fairy, Swoon, and Kenny Scharf. 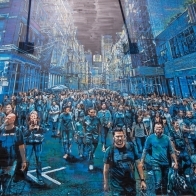 Hicks’ mural, entitled “The Story of My Life”, depicts important people who have influenced his life, from family and friends to colleagues in the arts, all congregating in what appears be a typical crowd on the streets of Manhattan. Hicks’ mural was praised by publications such as The New York Times and The Washington Post, Juxtapoz and Time Out magazines, and lauded as “spectacular” by Gothamist. As tradition mandates, the honor of painting the Houston Bowery Wall will be given to another well-accomplished artist this month, but “The Story of My Life” will live on beyond the temporary mural. Taglialatella Galleries plans to unveil a limited edition version of the iconic image as a hand-sprayed multiple on paper. Each work in the edition of 50 will be unique, spray painted by Hicks using 7 layers of stencils, hand-signed and numbered by the artist. The works will be available for sale through Taglialatella Galleries. For more details, please contact the gallery. The reception will also feature select works on canvas and board, including a larger format spray-painted re-creation of the mural on canvas. The artist will be in attendance and RSVP is required. The reception will be hosted at the gallery’s new location, 229 10th Avenue, on January 26th from 6-8pm. Please RSVP to info@djtfa.com or call (212) 367-0881.